Sometimes a great notion occurs when one least expects it. Standing in line at Voodoo Doughnut in downtown Eugene, for instance. Keri Aronson, associate director of development for the University of Oregon Libraries, was doing just that one Saturday morning when her attention wandered from the revolving glass display case of voodoo-doll-shaped, Froot Loop-embellished, and bacon-maple-topped confections to a large photograph on the wall. The photo shows Ken Kesey '57—the late author, Merry Prankster, and UO journalism graduate—juggling. Aronson, who is working to help the university acquire the acclaimed author's archives, sensed an affinity. She invited Voodoo owners Tres Shannon and Kenneth "Cat Daddy" Pogson to visit Knight Library for a firsthand look at the collection, which Kesey began depositing with the library in the 1960s, concerned that the original manuscripts, drawings, photographs, correspondence, and other papers would not be securely housed at his Pleasant Hill farm. The collection is remarkable in scope, depth, and the level of insight it offers into the creative process of a writer known not only for his novels One Flew Over the Cuckoo's Nest andSometimes a Great Notion, but for giving voice to the American counterculture of the time. "Ken took us from the Beats to the hippies," says James Fox, who heads Special Collections and University Archives at the library. "He wasn't some drug-crazed cowboy. He was a subtle thinker dealing with complex issues—his work is prescient in ways. Cuckoo's Nest is about the forces that control us, about shame and guilt, the dangers of big pharma. If you read it today, it all stands up. "And it's all here," Fox continues, gesturing toward an assortment of neatly organized, archival storage boxes. From one of the boxes, he produces a yellowed, typewritten manuscript. Numerous revisions are evident, with words and phrases crossed out, replaced, or rewritten. On the first page, a note is scrawled in pencil: This is the only copy. It is the original manuscript of Sometimes a Great Notion, widely considered an essential American novel, and certainly among the masterpieces of Northwest literature. Other boxes contain personal letters, additional manuscripts, and hundreds of pages that make up Kesey's Jailhouse Journal, many of them never published. Together, the materials illuminate both the creative process and the everyday life of a writer Fox considers critical to Oregon's identity. Tres Shannon and Cat Daddy Pogson apparently agree. "They couldn't have been more excited about the collection and what it means to the state of Oregon," says Aronson, describing the pair's reaction when she showed them the Kesey archive. It seems likely Kesey would have approved of their response—they created a special doughnut, the Easy Peasy Lemon Kesey, topped with psychedelic-colored icing and, appropriately, a sugar cube. 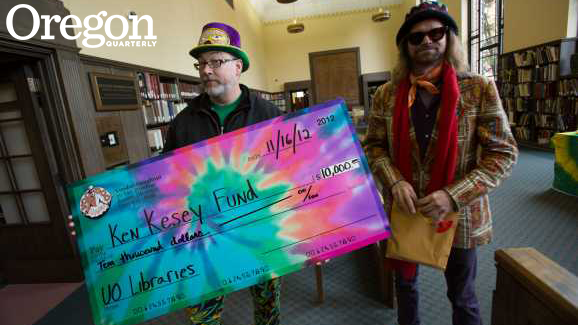 A portion of the proceeds from each Lemon Kesey supports the Kesey Fund, established through the UO Foundation to help purchase the collection, keeping it intact and accessible to students and scholars at Knight Library.